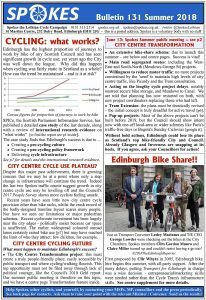 Spokes Bulletin 131 is on its way to Spokes members, to 1200 decision-makers across Scotland* and to another 10,000+ interested people through bike shops, libraries and so on throughout Edinburgh, Lothian and beyond. *including all 129 Scottish MSPs, all 132 Edinburgh+Lothians councillors, transport consultants, health officials, etc, etc. You can find pdfs of this and earlier Bulletins on our Spokes Bulletin page. Everyone joining Spokes in the next few weeks will be posted the above inserts along with the new Bulletin. Having more members helps us – and we hope to help you in return by keeping you in touch with what’s happening and what you can do about it! You’ll get a roughly-monthly email in addition to the thrice-yearly Bulletin. We have spares of the new Bulletin for bike leafleting at workplaces, shops etc – let us know if you could use a supply. Many Spokes members take a regular supply of each issue for their local workplace, shops or other useful destinations. Please retweet our tweet about the new Bulletin.